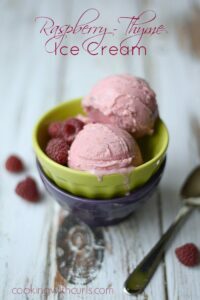 This time last year, I did not have one single ice cream recipe on this blog. Not a one! This year, I think I have more than made up for lost time. 😉 This Raspberry Thyme Ice Cream makes Four recipes so far!! Two with alcohol, and two without. 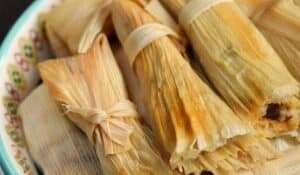 Personally, I still prefer the ones made with alcohol, because they do not freeze solid. 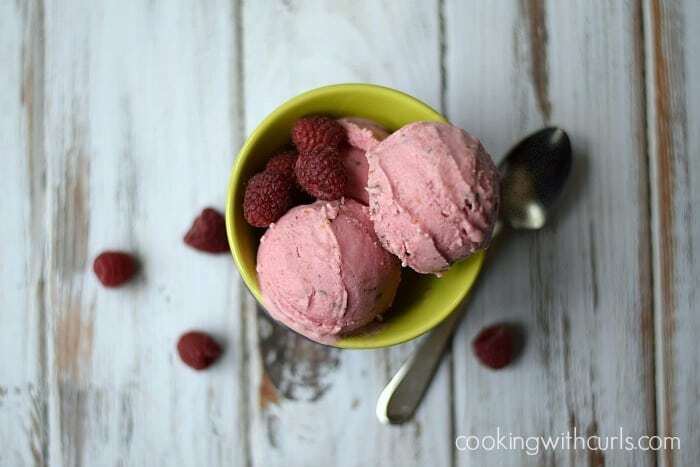 This Raspberry Thyme Ice Cream does not contain alcohol. It is vegan, dairy-free, and guilt free…it is made with fruit after all. Fresh raspberries contain high levels of assorted vitamins and minerals needed for healthy body functions, including potassium, calcium, lutein and zeaxanthin. Raspberries are extremely high in various antioxidants, and help with inflammation. So why on earth did I pair raspberries with thyme? Thyme contains a variety of bioflavinoids and volatile oils that have powerful anti-oxidant properties. Thyme is also a powerful antiseptic and antibacterial agent which helps with all around good health. 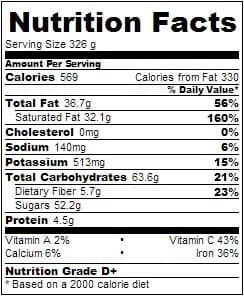 Now add in that thyme is a very good source of calcium, iron, manganese, chromium, vitamin K and fiber, and I have created ice cream that is good for your health! Did you notice who was missing from the Mahi Mahi with Panko meal? 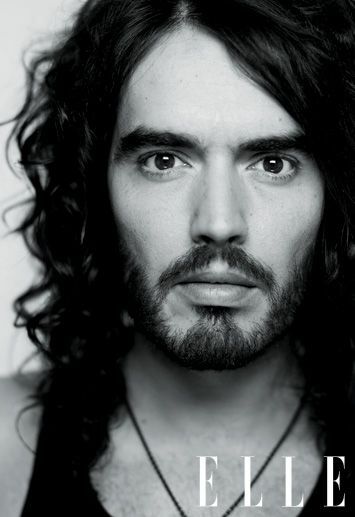 I completely forgot to throw in an image of our imaginary date, Russel Brand. Thankfully this portion of the meal is vegan, so I won’t get a reprimand. 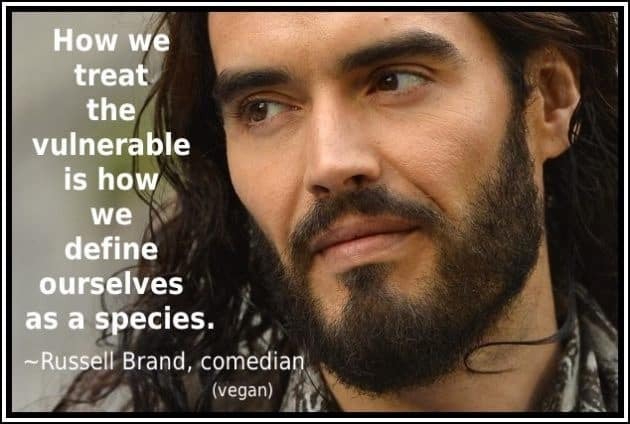 😉 Comedian and Activist, but not a good match with “Scorpio” Katie Perry. Would you like to make some ice cream now? 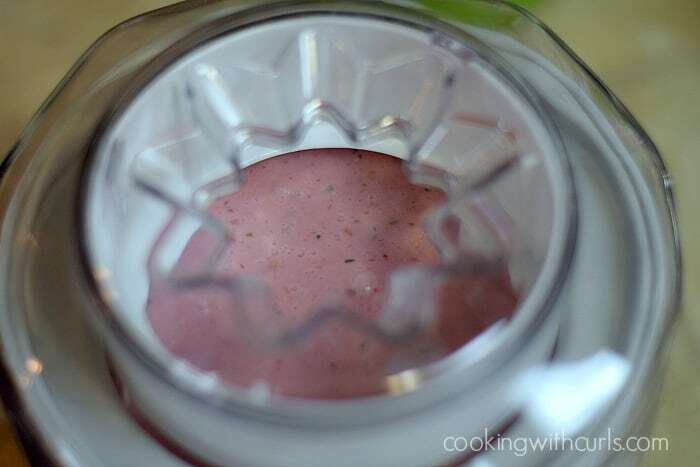 Start by pureeing the raspberries in a food processor….. I was hoping that it would pulverize all of the seeds, but sadly it did not. Next time I will strain the puree before adding the rest of the ingredients….. I have a serious hatred of seeds! 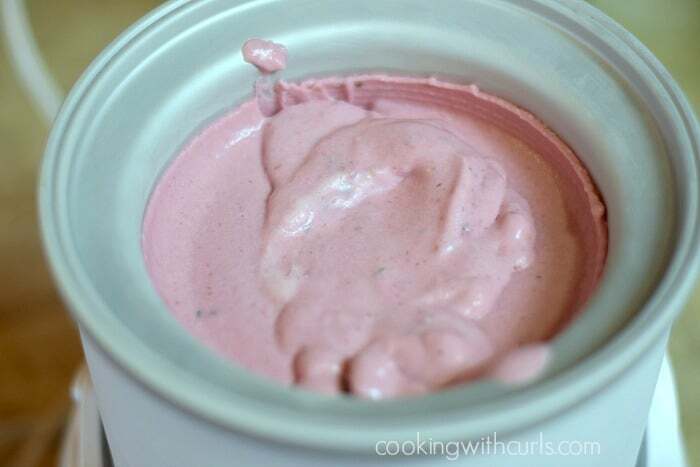 Process until smooth and well combined…..
Pour into the bowl of an ice cream maker, and process according to the manufacturer’s instructions….. Mine takes about 20 minutes…..
Pour into a freezer safe container….. Freeze until ready to serve…..
You may want to test the flavor before adding the entire 1 Tablespoon of vanilla, and adjust to your tastes. I wanted to mask the flavor of the coconut milk (which the alcohol usually does) and liked the results. You may prefer to coconut flavor, or a more subtle vanilla flavor. As always, feel free to substitute half and half for the coconut milk. Next up we will be having Breakfast Tostadas…yum! Okay, one more since I forgot the other day….. 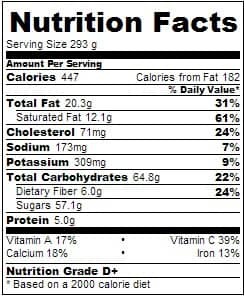 I have no idea why the serving size is different, it is the same recipe! 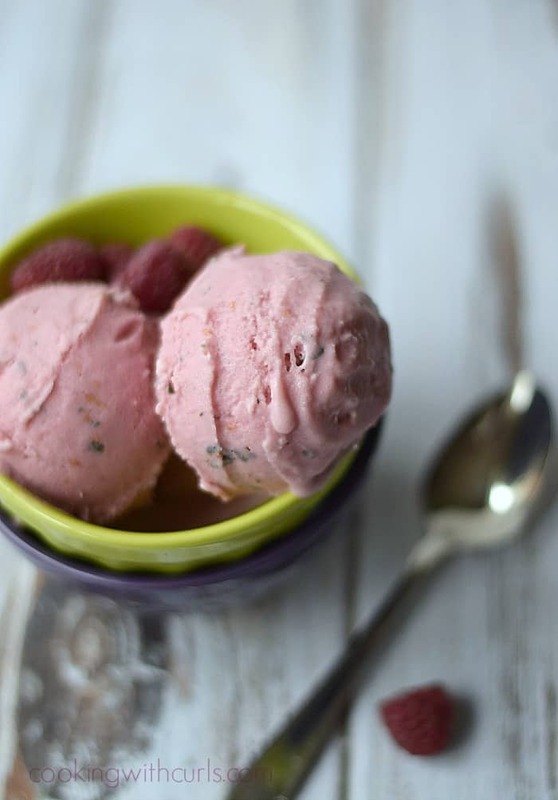 This dairy-free Raspberry Thyme Ice Cream is a perfect summertime treat. 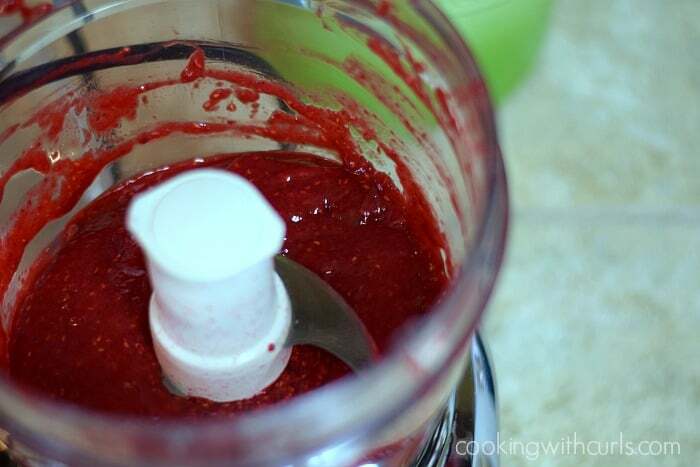 Place raspberries in the bowl of a food processor, process until smooth. Add the coconut milk, agave nectar, thyme, vanilla, and salt. Blend to combine. Pour mixture into ice cream maker, and process according to manufacture's instructions. 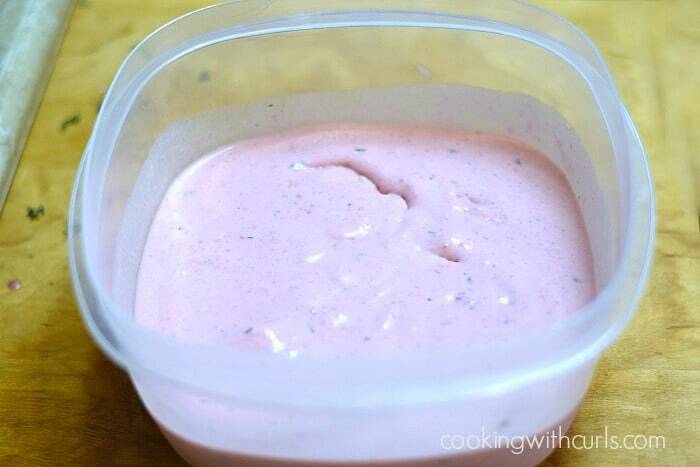 Place in a freezer safe container, and freeze until ready to serve. WHOA! This ice creamlooks crazy good, Lisa! We need to have an ice cream date stat! Oh my – this does look good. Can’t wait for raspberries to come down in price! 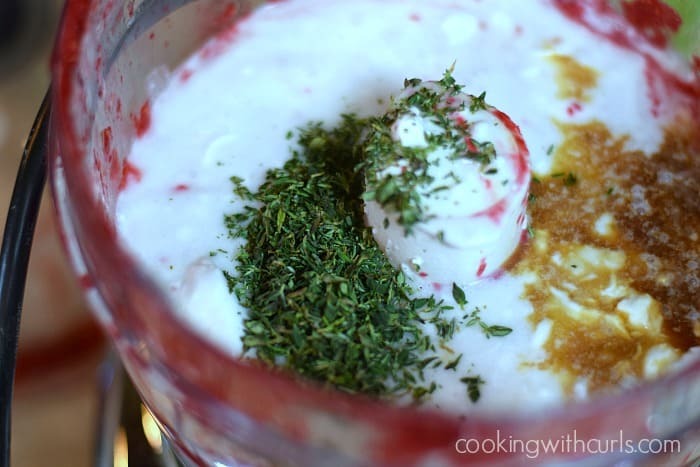 I’ve never thought to combine raspberry and thyme, but it sounds perfect! I have fresh thyme in my herb garden and always have plenty of raspberries this time of the year. I definitely need to try this soon! Wow! 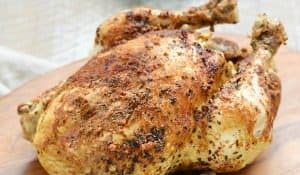 I just love this recipe Lisa! It’s one of those combinations that you may question at first but once you taste it you will fall in love! The color is gorgeous and absolutley tempting! Well done my friend. 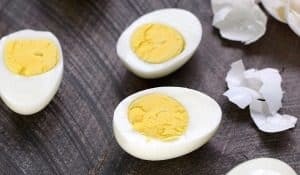 This is my kind of recipe! 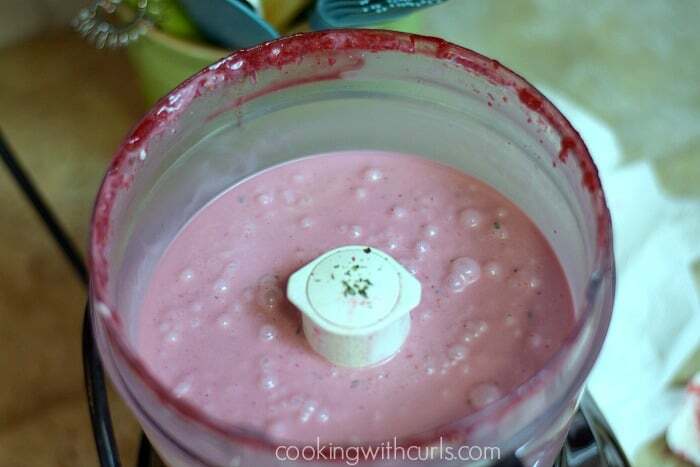 Berries plus herbs and coconut milk. I love these combinations, Lisa! Thanks so much for sharing! Now where is that “follow” button…. This makes me want to run right out and buy an ice cream maker! Pinned anyway! My goodness—this looks so tasty! The vibrant colors are just lovely as our your photographs—I really want some right now:) pinned. found at cast party wed. Have a wonderful week. I’m where you were a year ago! I have ZERO ice cream recipes on my blog…..time to change that! This is great inspiration….such a delicious recipe, Lisa! !